The Blanton Museum of Art at the University of Texas at Austin presents Witness: Art and Civil Rights in the Sixties, an exhibition of approximately 100 works by 66 artists that explores how painting, sculpture, drawing, printmaking, and photography not only responded to the political and social turmoil of the era, but also helped influence its direction. Organized by the Brooklyn Museum in New York, the exhibition highlights the wide-ranging aesthetic approaches used to address the struggle for civil rights. 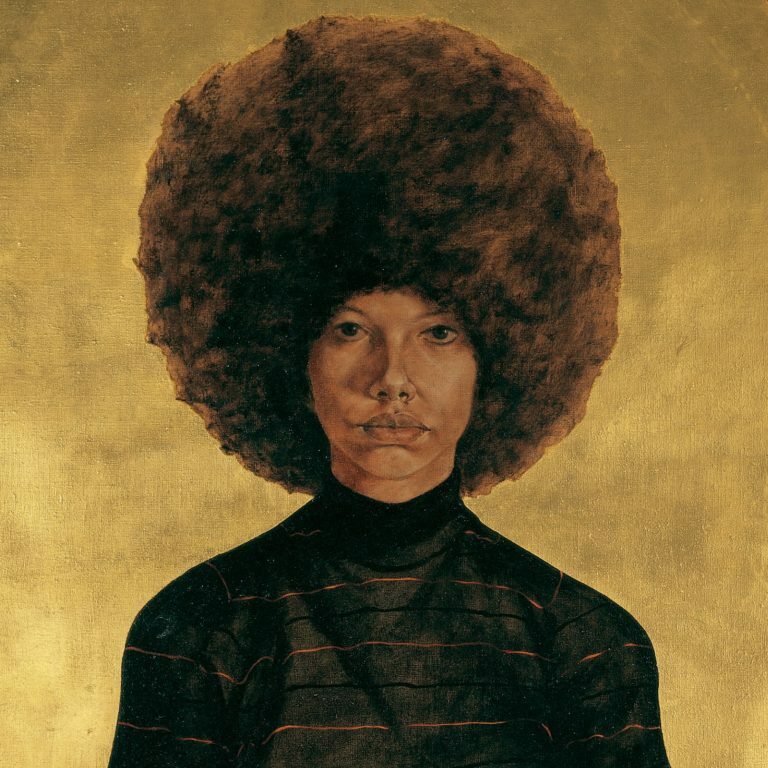 The diverse group of artists in the exhibition includes, among others, Barkley Hendricks, Charles White, Andy Warhol, May Stevens, Philip Guston, Betye Saar, David Hammons, Jack Whitten, Danny Lyon, Romare Bearden and Faith Ringgold. Unique to the Blanton’s presentation is the inclusion of a rarely-seen portrait of President Lyndon Baines Johnson by Norman Rockwell—a special loan from the LBJ Presidential Library. Organized thematically, the exhibition will include sections titled Integrate/Educate; American Nightmare; Presenting Evidence; Politicizing Pop; Black Is Beautiful; Sisterhood; Global Liberation; and Beloved Community. Among the works on view will be Jack Whitten’s Birmingham 1964, which was created in reaction to the famous race riots in that city and uses layers of black paint, crushed aluminum foil, and sheer stocking mesh to reveal and obscure a newspaper photograph of the confrontations between protesters and police in Birmingham. Also included are works by Charles Alston, Emma Amos, Merton Simpson, Norman Lewis, and Romare Bearden, all members of Spiral, a group of African American artists living in New York who collectively explored how their practices could engage with the struggle for civil rights. Other highlights of the exhibition are Jae Jarrell’s Urban Wall Suit, a painted fabric suit inspired by activist murals and urban graffiti that anticipates the current confluence of fashion and art; Robert Indiana’s boldly graphic painting The Confederacy: Alabama, with a central map that references the violence-ridden Selma-to-Montgomery March; Barkley Hendricks’ Lawdy Mama, embodying the “black is beautiful” mantra by presenting a woman crowned with a halo-like afro in a golden altarpiece; Charles White’s powerful drawing, Birmingham Totem, which pays homage to the four girls who died in the 1963 church bombing and the two boys killed in the ensuing violence; works by the Georgia-born, New York-based artist Benny Andrews, whose images of rural African Americans incorporate coarse fabrics in densely painted surfaces; and Sam Gilliam’s Red April, a monumental abstract painting that he made in response to Dr. Martin Luther King’s assassination on April 4, 1968. Photographers in the exhibition, such as Richard Avedon, Bruce Davidson, Roy DeCarava, Danny Lyon, Gordon Parks, and Moneta Sleet Jr., captured the events of the Civil Rights Movement as both documentarians and activists, often influencing public opinion with their images in newspapers and magazines such as Ebony and Life. Among other photographs, the exhibition features Danny Lyon’s image of Bob Dylan playing his guitar before a group of SNCC workers outside their Greenwood, Mississippi office and Gordon Parks’ images of Muhammad Ali, Eldridge and Kathleen Cleaver, and other public figures. A gallery will be dedicated to a video of Nina Simone’s famous 1964 performance of “Mississippi Goddam,” a powerful protest song that became an anthem of the Civil Rights Movement. Simone wrote the song in response to the murder of Medgar Evars in Mississippi and other racially-motivated killings of African Americans in the South. Blanton curator Evan Garza and Dr Don Carleton, director of the Briscoe Center for American History, join Mark Updegrove, director of the LBJ Presidential Library, for a conversation on the Civil Rights Movement. Images from the Blanton’s Witnessexhibition and from the Briscoe Center’s photojournalism collections will be discussed. Film Screening | Thursday, February 19, 6:30 p.m. Eyes on the Prize: The Promised Land (60 minutes) Covers the last year of Dr. Martin Luther King Jr.’s life and the turn of the Civil Rights Movement toward addressing economic inequality. Conversation with film director Paul Stekler follows. Blanton Perspectives | Sunday, February 22, 2 p.m. Artist Jack Whitten and Witness co-curator Kellie Jones discuss the works and themes of the exhibition, with a focus on Whitten’s work and the development of his practice since the 1960s. The exhibition is accompanied by a fully-illustrated catalogue published by the Monacelli Press. It includes essays by co-curators Teresa A. Carbone and Kellie Jones, with additional contributions by Cynthia A. Young, Connie H. Choi, and Dalila Scruggs. Witness: Art and Civil Rights in the Sixties is organized by the Brooklyn Museum and made possible by the Ford Foundation. Generous funding for this exhibition at the Blanton is provided by Jeanne and Michael Klein, with additional support from Chase, Nancy and Bob Inman, Melissa Jones, Alec Rhodes, Regina Rogers in memory of Jack S. Blanton, Sr., the Texas Commission on the Arts, and a grant from Humanities Texas, the state affiliate of the National Endowment for the Humanities. The exhibition was organized by Teresa A. Carbone, Andrew W. Mellon Curator of American Art at the Brooklyn Museum, and Kellie Jones, Associate Professor in the Department of Art History and Archaeology at Columbia University.